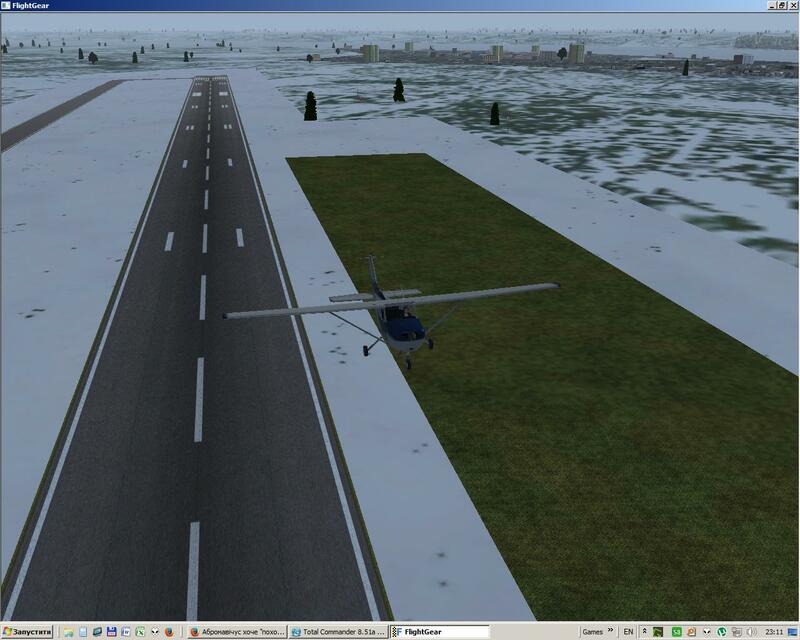 I've just installed FlightGear-3.6.0-nightly-full.exe on my Win7 PC, old Flightgear folder was renamed to Flightgear~ and new version installed in Flightgear. 1) Asked me about data folder, I've guessed it is fgdata and I was right, please make it obvious in the launcher what folder should i select, this issue is probably related to my config and people who upgrade will see it too. 2) Default tab is always "settings", it does not remember my tab of choice. BTW: need more settings! 3) Aircraft tab: Height of the aircraft entries is fixed, but width of the image of an aircraft can be different and text is displaced a little to left or right, would be nice if pictures and text will be lined up/resized properly (height should be fixed as it is now). 6) My config from 3.4/3.5 was not loaded automatically by 3.6 so I've set up everything again (there was crash after exit with jetway errors, so I resetuped everything yet again because it lost my changes). If I change airport in game when in Cessna's cockpit it silently throws me in "walker mode" (no text balloon) with me standing higher than the plane, but it is OK after some moves. 9) Cessna is very nice, it has much bigger CHECKLIST with lots of different modes, when I open menu with them (list of entries like Before starting, Take off etc) it is too big for my 19" 5:4 (which has huge height already), it would be nice to have arrows to move from one checklist to another without that troublesome menu selection. 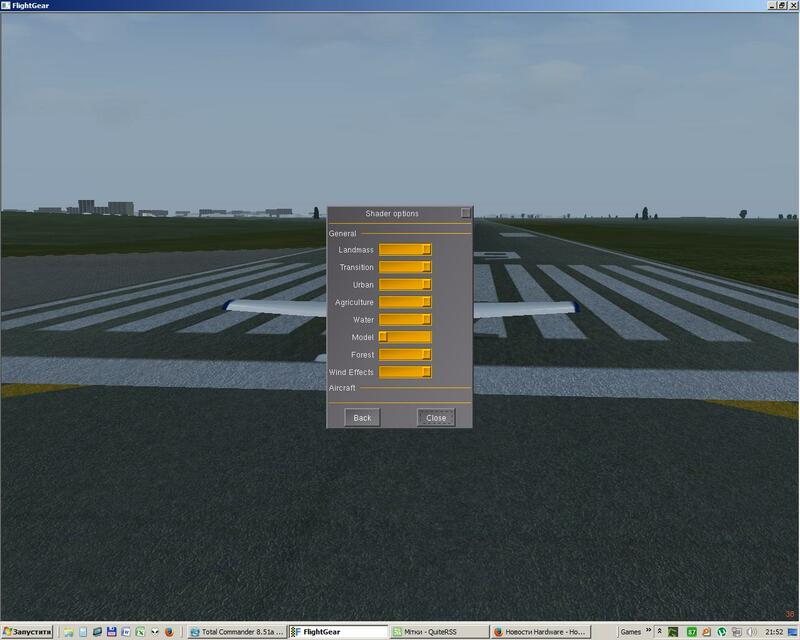 11) When I switch with alt+tab between simulator and other programs flightgear will change its mouse behaviour (TAB key). Really annoying. 12) Is that popup in the middle of the screen about "cycling mouse behaviour" is really necessary? How i suppose to fly with it blocking my view!? Could you move it somewhere else? or disable at all? 13) Some airplanes will not work yet (like 707). So far I like it, but those issues should be mitigated. Will continue to test it some more. I will post updates here. Last edited by Bug Bunny on Fri Aug 07, 2015 4:24 pm, edited 1 time in total. I won't comment on the new launcher as I haven't actually seen it (my Linux version is compiled without). That's intentional to prevent obsolete historic configuration settings messing up a new installation and making debugging virtually impossible - you'll have to re-configure for every new version number. Known and currently being dealt with - fix should hopefully come over the weekend. I would guess that screen resolution is what matters, no physical size of the display. Making things automatic would require information what works for what GPU architecture/driver - if we had that kind of detailed understanding of issues, we could probably make it work for every use case. I don't understand why it is problematic to take 20 minutes to try out rendering options and see which work on your system - they're archived and you never need to configure them again till the next version. 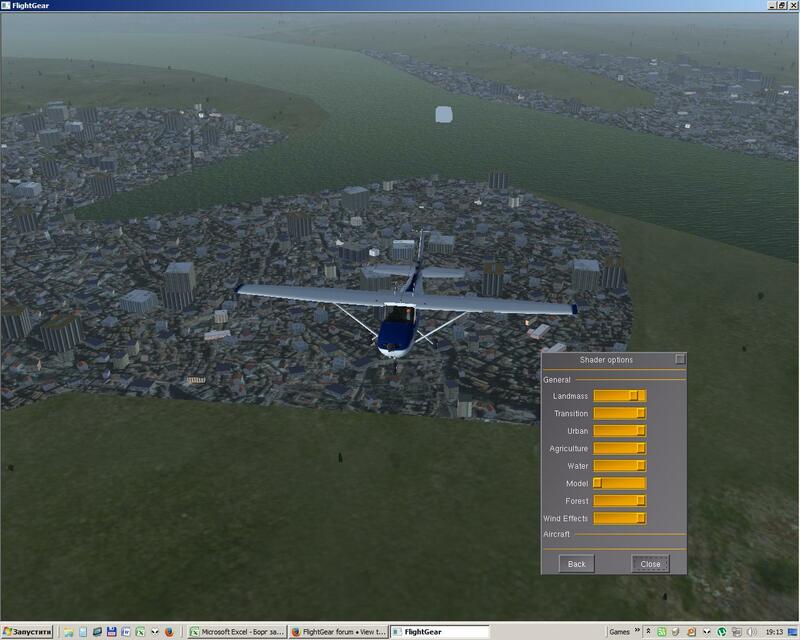 + When I switch with alt+tab between simulator and other programs flightgear will change its mouse behaviour (TAB key). Really annoying. I guess you can change key binding if you need to do that. + Is that popup in the middle of the screen about "cycling mouse behaviour" is really necessary? How i suppose to fly with it blocking my view!? Could you move it somewhere else? or disable at all? There's a view option to disable it. + Some airplanes will not work yet (like 707). Would need to be told to the maintainer with somewhat more details I guess. Is there a forum thread for the plane? Like Thorsten says, we need to have a better understanding to do this - however, it is certainly possible (even trivial) to automatically disable/enable featueres based on the detected GPU - for an example, refer to the rendering dialog and its Intel GMA related heuristics (showing the warning). Here it is what I mean https://i.imgur.com/DncKB4n.png , it is too long even for 1280*1024, it could probably fit in 1920*1200 mode. It is troublesome to use checklist with drop-up o_0 menu. Probably, but default one is very irritating, I can't switch between tasks with a keyboard, because it messes up FlightGear control modes. Last edited by Bug Bunny on Fri Aug 07, 2015 4:06 pm, edited 3 times in total. 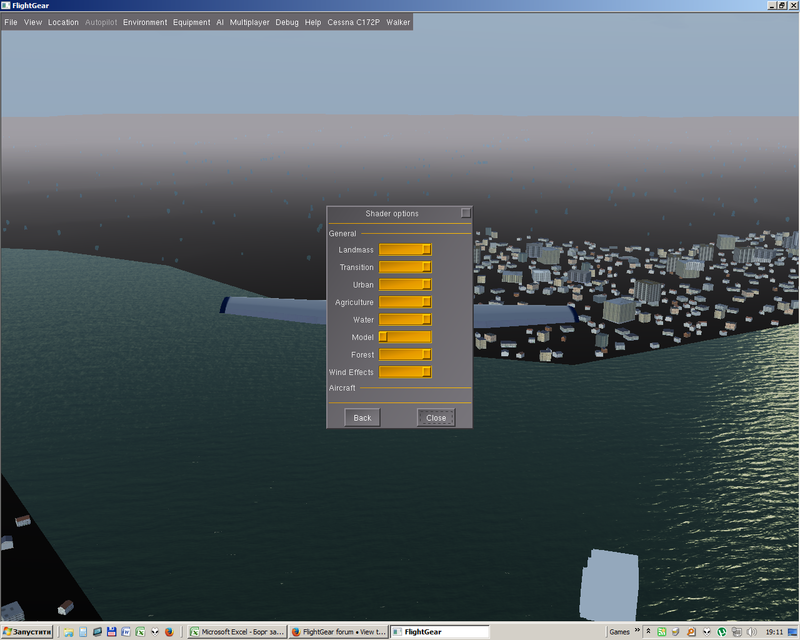 Just checked, in all rendering modes (ALS off and on), looks like this bug affects only when "random buildings" is "on". Last edited by Bug Bunny on Fri Aug 07, 2015 5:01 pm, edited 2 times in total. My videocard is ATI Radeon 6870 with Catalyst 14.5 driver. There should be a shader compilation error in the log file going with that one - what is it? 16) Model shader setting set to MIN causes weird buildings bug: farther building is actually closer, look at those pics: https://i.imgur.com/v0XOuOD.jpg (bottom left, to the right on horizon is landscape MAX bug on some tile) and https://i.imgur.com/nJOqqKy.jpg (horizon). 17) Location -> Select airport, another weird walker bug is that when I choose another airport I end up outside WITHOUT the aircraft , need Ctrl-V to mitigate this problem. 18) Location -> Position aircraft in air - set 2000ft and 10nm away from airport (speed before that does not matter), I end up OUTSIDE yet again and my Cessna starts practically at stall speed and drops furiously to the ground (every time I set it, no chance). 19) Probably not a bug: If you used "Location -> Position aircraft in air" and then do File -> Reset it will teleport you to a position stated in "Position aircraft", not to airport where you started. 20) Walk view and Walker orbiter shows somewhere at sea/ocean far away (i was unable to get a position, but it probably resets to some point far away). 21) Cessna autopilot in default roll mode tends to go to the right side if you do some experiments with views or settings (after the freezes), could be solved by reenabling AP. 23) Shadow in a cockpit effect is cool and working, only one thing to check: https://i.imgur.com/wm9fKym.png - SUN is back and to the left, look at the instruments, do you see || || || shadow effect on some instruments (like equally space vertical wire shadows)? I'm not quite sure what thing exactly makes such shadows... main shadow is to the right. 26) File -> Load flight recorder tape, if you play some records you will see it is not honouring time of day when it was recorded, it uses current time for playback. 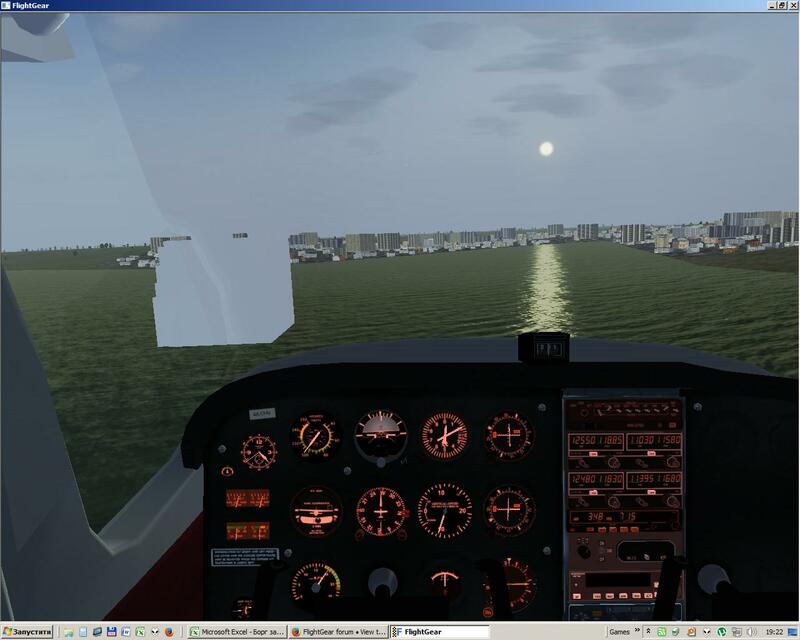 27) File -> Load flight recorder tape, when I press END replay (my cessna is at cruise speed) it disables the engine and while having nice speed it will go nose dive instantly and stoll and crash, note save is from 3.4. 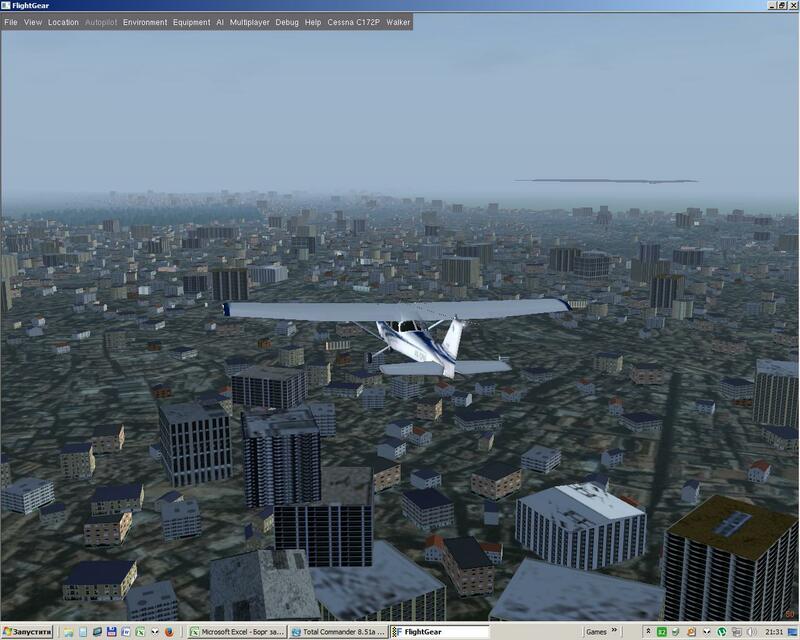 END replay function works strangely, in most of the cases it is impossible to regain controls on cessna. Added new bugs to the list. Too much bugs. Last edited by Bug Bunny on Fri Aug 07, 2015 11:58 pm, edited 2 times in total. 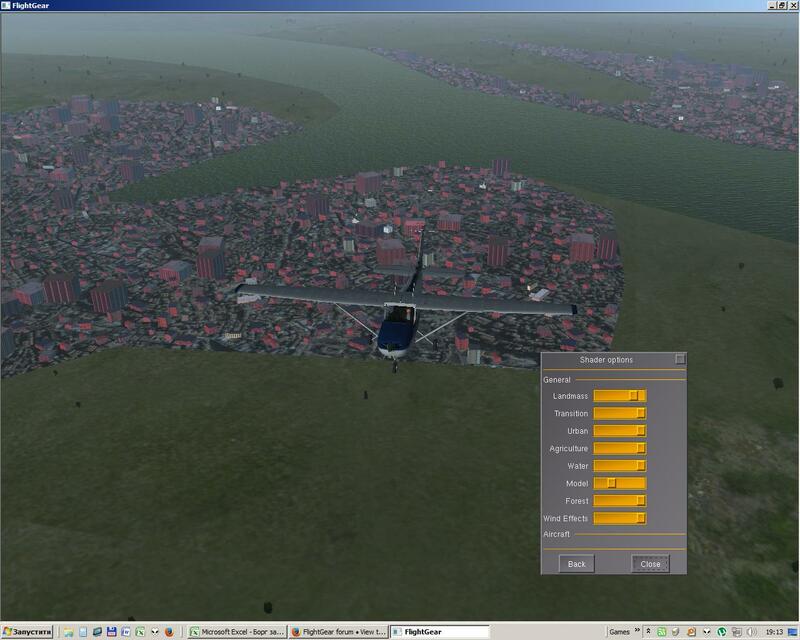 There is a way around documented in the wiki section FlightGear configuration via XML#Adding your own settings. Basically you can add stuff to a separate configuration file that overrides "preferences.xml" when included using the option "--config=<Path to you config file>/<Your config file>.xml". That way you will only have have to makes small changes for things not compatible between the versions. I see from the screenshot below that it would work really bad for me. Note though that you can move around the dialog by holding the left mouse button over most parts of the dialog and drag it to where you want it. Unfortunately it seems that PUIs (the rather old user interface library's) widgets do not make use of the scroll wheel. That is probably not all that weird. Grass runways on frozen ground are sometimes kept plowed and maintained in the winter. Only one or a few days of thawing could lay them bare while the surroundings would still be snow covered (see for example the 3rd picture here). You mean it is not? As you can see, the first error refers to a shader of the ALS family whereas the second error does not - however, these two shaders come from different rendering frameworks and hence should never be compiled together. The errors themselves refer to a dual declaration of a shader main body - which definitely isn't the case in any of the two files. The building thing is a z-buffering issue - part of the fixed pipeline functionality which we don't actually code - we just set a flag for the card to do it. So - are we talking about a pristine setup (i.e. 3.6 RC with matching FGData, installed into empty space and not over some custom tweaked config)? I honestly can't come up with a scenario in which shaders from different rendering frameworks would be compiled together (also - water-sine hasn't changed in quite a while, so it's odd that it would suddenly be problematic). Again, this should go hand in hand with a shader compilation error. Also - does this happen in all frameworks, ALS only, at what quality level happens what? (I don't think anything has been done to the building vertex shader since 3.4 at all). Is other 3d stuff not related to FG running for you properly? I find it strange that things which have not been modified cease to work and that for the last months there was no problem reported from any ATI user on the devel list and suddenly you see a whole bunch of weird issues all at once. Yes, this is a truism - random buildings can only appear red if they're there in the first place. If it occurs in all rendering modes, then Emilian's efforts seem to have failed and it seems unfixable. I can't reproduce it and I have no clue where to start looking for it without that. As for the rest behavior and in-sim reposition, you can safely assume that this doesn't actually work right now (it breaks the whole effect framework just as well and my suggestion has actually been to remove to option from the menu). The shadow is a visual illusion and last time I checked the effect wasn't applied to the instrument faces at all - so there's nothing making a shadow on them, you're probably seeing something else. That is probably not all that weird. Grass runways on frozen ground are sometimes kept plowed and maintained in the winter. I guess someone could make a texture for it which shows brownish and icy grass. Given that the whole set of winter textures is by now legacy since we can draw snow procedurally onto the terrain and since it doesn't agree with the regional schemes anyway but is rather Europe-centered, I don't see an urgent need, but if anyone wants to make the texture, I'll be happy to commit it. Reproducible only partially, not all landscape is dark but only part of it. Maybe because I was switching in-game from ALS on to ALS off to test it. So - are we talking about a pristine setup (i.e. 3.6 RC with matching FGData, installed into empty space and not over some custom tweaked config)? Yes, into empty space with fgdata from the installer, however I did not remove old 3.4 config. It happens in ALS only, I use custom settings (not quality level), it happens when MODEL is set to MIN, changing other shader settings does not affect it. BTW, when I set quality level to MAX, it seems it is not really at MAX level, because when I go to custom settings, some entries are not at MAX, like landmass, transition, is it supposed to be that way? Is other 3d stuff not related to FG running for you properly? It looks like big grid (horizontal and vertical as well), but it is hard to see on a screenshot, but good when in movement when sun is behind. I agree, I will make additional topic here. 28) It seems that if I run new FlightGear launcher, make some changes (airport, settings), but quit after that, this changes will not be saved.